It’s always best to know what you’re up against. If you suspect you may have a termite infestation or simply want peace of mind, Arceneaux Pest Management will schedule a convenient, free termite inspection with one of our qualified technicians. Baton Rouge termite inspections are important–you need to know if you’re part of the hundreds of millions of dollars in damage that occurs each year in the Baton Rouge area due to termite damage. Termites are social insects, meaning that they live in colonies and where there’s one, there’s always a whole lot more. Termites feed on “cellulose-based plant material” which can be found in any number of construction materials, including the wood used to construct a home and even trees and shrubs surrounding your home. Native subterranean and Formosan termites thrive on moisture and infest the foundations of a home where there is lots of food for them as well as lots of moist soil. They can also create tunnels hundreds of feet long that allow them to reach a food source and then bring it back to the colony. Formosan termites are also a very common species and are considered very aggressive. Where Native termites only live below ground, Formosan termites can also build above ground colonies. While Native and Formosan termites require moisture to survive, Drywood termites make their homes in any dry, rotting wood they can find and can spread very quickly once they have established themselves. Since termites live underground, spotting termites before it’s too late can be difficult. However, there are some warning signs. The most obvious sign is a swarm of winged insects in or near your home. 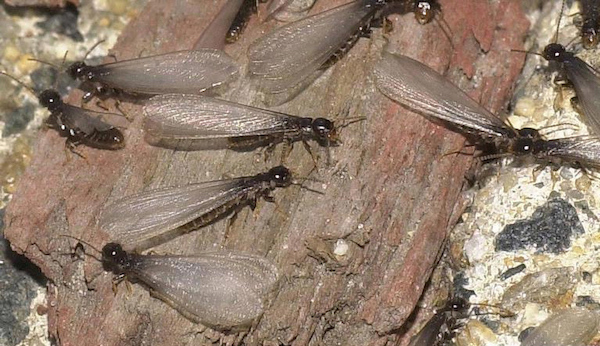 While not all termites in a colony have wings, those that do are called swarmers and it’s their job to find a new location for the colony to spread to. Even if you don’t see the swarmers themselves, you may find their wings, which they drop once they’ve found a new colony location. Finding termite damage to your walls, floors and trim work is common too. If you suspect you might have a termite infestation (mud tunnels on your slab foundation) or you find wood that is damaged but you are not sure what caused it, it’s time to call in the professionals at Arceneaux Pest Management Service. Many of these signs are subtle or hidden underground, within walls, or within the very structure of your home. The very best way to determine if you have termites is to have an Arceneaux Pest Management technician come and inspect your home. We are able to check all the places termites like to live and we have the expertise to know exactly what you’re dealing with and how bad it is. At Arceneaux Pest Management Service, your first termite inspection is always free and we will always provide you with a detailed pest control plan to help protect your home. The best way to ensure that termites stay away is to keep an eye on their food source: your home. Our annual inspections will make sure that your home is covered and any termite invasion is dealt with quickly, before they are able to do any expensive damage. To receive an annual inspection, Arceneaux must first perform an initial termite treatment to your home (this is state law). You cannot have a termite contract in Louisiana unless your home has been treated. Once treated, you are able to renew your contract annually. Even if you don’t have a visible infestation, it’s always smart to get your home inspected. Remember, there are 8-10 termite colonies of Native subterranean termites per acre in South Louisiana. Each mature colony is about 250,000 termites, which means there are over 2 million termites per acre. A Formosan colony can have 1-10 million termites or more in a colony and eat 1,000 pounds of wood a year. Don’t delay; get your home inspected today.